Power and Irrigation Minister Rana Gurjeet Singh today said that Chief Minister Captain Amarinder Singh has been committed to safeguard the water interests of the state and it has been proved in the chapters of history that he never let down the interests of the state may it be struggle at village Kandu Khera or passing act in the assembly to safeguard the waters of the state.Addressing the function organised here to handover appointment letters to newly appointed 732 Canal Patwaries, Rana Gurjeet Singh said that as per program Chief Minister Captain Amarinder Singh had to welcome these newly appointed youngsters in the government but he was busy in a meeting regarding SYL issue. He said that for the state like Punjab nothing is important and above than its waters.Congratulating newly appointed Canal Patwaries and their family members on this occasion, Rana Gurjeet Singh asked them to do good for their state and family. "All of you are young and talented. Department will assign you duties as per your caliber and not just the duties assigned for the post of Canal Patwaries ", said Rana Gurjeet. Suggesting the change in nomenclature of the post of Canal Patwari to some more technical one, Irrigation Minister said that most of the newly appointed Canal Patwaries were efficient enough to perform various challenging jobs for the department. "We are facing challenges like depleting water level and water pollution. We all are bound to contribute our best to solve these problems. 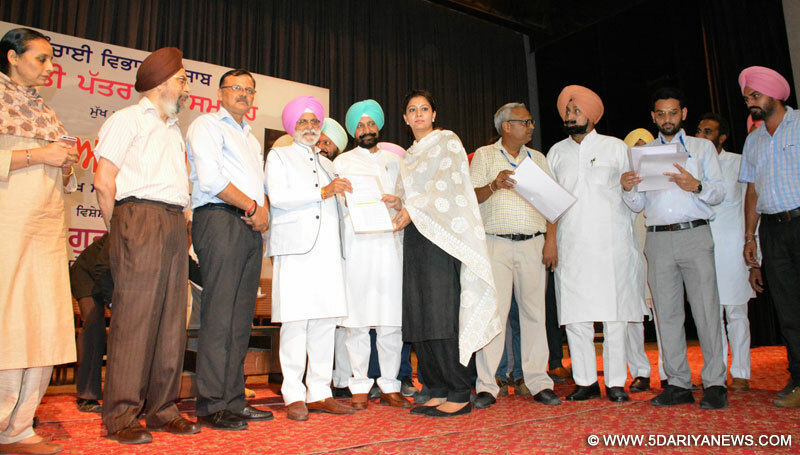 I hope that newly appointed Canal Patwaries will do their best during their service period in this direction too", added Rana Gurjeet.Irrigation Minister said that out of 732 newly recruited Canal Patwaries 236 will be posted at Sirhind Canal Circle Ludhiana, 116 at Ferozepur canal circle Ferozepur, 214 at IB Circle Patiala, 41 at Bhakhra Main Line Circle Patiala, 83 at Upper Bari Doab Canal Circle Amritsar and 42 at Bist Doab Jalandhar.Earlier, Balbir singh Sidhu, MLA, Jagmohan Singh Kang, former Minister, V.K. Singh, Principal Secretary Irrigation Department, A.S. Miglani, Secretary Irrigation also addressed the gathering and stressed on the need of water conservation.Prominent amongst others Sushil Rinku, MLA, Parampreet kaur Sidhu, Additional Secretary Irrigation, Gurpreet Kaur Sapra, Deputy Commissioner Mohali, Pushpinder Garg, Chief Engineer Irrigation and a number of senior officers of irrigation department were also present on the occasion.